Is this manga cartoon of a six-year-old Syrian girl racist? "I want to live a safe and clean life, eat gourmet food, go out, wear pretty things, and live a luxurious life… all at the expense of someone else," reads the text on the illustration above. "I have an idea. I'll become a refugee." 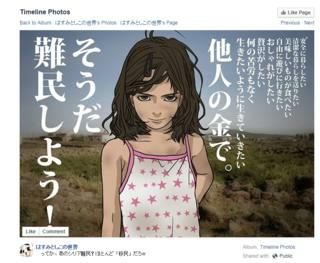 The image and caption were posted by a right-wing Japanese artist last month. Now, more than 10,000 people have signed a Change.org petition in Japanese urging Facebook to take it down. The petition, posted by an account calling itself the "Don't Allow Racism Group", claims that several people have reported the illustration and demands that "Facebook must recognize an illustration insulting Syrian refugees as racism." Although the Japan Times reported that Facebook did not take the picture down, saying it did not go against community guidelines, the artist herself removed the picture. But she remains defiant about her motivations for posting it in the first place. Toshiko Hasumi told BBC Trending that she believed the people signing the petition were left-wing activists. "I draw many political mangas [Japanese comics] which are not favourable to them," she said. "This is why they targeted me." Japan has pledged to contribute $810m to help Syrian and Iraqi refugees, but Prime Minister Shinzo Abe has refused to take in any of those displaced by the conflict in those countries. Japan accepted only 11 of 5,000 potential asylum seekers last year. Japan is one of the most ethnically homogeneous countries in the world, and immigration is hugely controversial despite the country's declining and ageing population. Toshiko took the drawing down from her Facebook page on Wednesday, citing a request made by Hyams, who earlier tweeted: "Shocked+deeply saddened anyone would choose to use an image of an innocent child to express such perverse prejudice". Save the Children said it was "saddened" by the cartoon. "To use this image out of context and in a way that is hugely disrespectful to [the girl], her family and all refugees is not acceptable, and we are satisfied that the image has now been removed," the charity said in a statement. But despite removing the photo, Toshiko was unapologetic creating it: "I don't want European nations to be victimised and hard working people should not suffer by those fake immigrants," she told Trending. She admitted trying to be provocative by using an image of a young girl. "The simple reason I used a girl is, if I drew an old man it wouldn't have gained attention," Toshiko said. "I am not denying that there are real miserable refugees. I am just denying those 'fake refugees' pretending like victims who are acting for their own benefit by exploiting the media attention on the real poor refugees."